As most of you know our ram Merlin did not do his job of producing babies a few years ago, which in the past has been his claim to fame. His record was 16 babies in two week's time. On our farm it is very difficult to have more than one ram. Rams are very territorial and will actually try to kill another ram. So the question was....what do we do with Merlin?? He had done his job well in the past but obviously he was past his prime. A "real" farmer does not feed an animal that will take up space for a ram that can't produce....plus he had horns and knew how to use them. ....So I started to pray for a solution. A few days later I got a random phone call. The man said, "My name is Jimmy, and your number is in my phone and I am trying to clear out numbers that I don't need. Do you know who I am?" He asked me if I had sheep and I told him about my sad story of having no lambs born that year and I really needed a new ram, but Merlin is really mean and no one would want him. Jimmy told me that it was funny that I would say that because he was hired by the state of New Jersey to clear land with his goats. He was apprehensive to put his goats out in this fenced area because he was afraid that someone would steal them. If he had an "attack ram" in with his goats, then no one would bother them. I told him to come and get Merlin for his new job. When Jimmy got here to pick up Merlin he had remembered coming to my farm about 3 years ago to pick up sheep for someone else, so that is why he had my phone number. I told him to please be careful and he told me not to worry as he had once been in a rodeo. He skillfully threw a lasso that landed right over Merlin’s horn. He pulled the horn close to him as his buddy grabbed the other horn and they walked Merlin to the truck and drove off. About one week later a girl scout troop came for a class and I shared this story with them. The girl scout leader told me that the department that she works for, hired the goats to clear the land. She explained that there is an endangered species of turtles that live in bogs that are being overtaken with briars and if the goats eat the briars there would be cleared bogs for the turtles to live. Now I am even more proud of Merlin for having such an important job. He is a state employee, with benefits and is not effected by the furlough. It just makes me so happy to know that God cares about making all things work together for good. As I am getting older and just got a new knee I am now trying to make the size of my sheep smaller so I will not have to wrestle such big sheep. My new ram is a South Down Babydoll named Java. He is much sweeter and easier to handle than Merlin and is doing a fine job at doing what rams do best. We now have two sets of twins and one single born, all ready to meet the world. This year’s name theme is Wizard of Oz so our Lamb Celebration Day will begin on Saturday, February 16th from 10am til 2pm where you can meet Dorothy, Toto, Glinda, Almira and Hickory. We look forward to you spending time and taking pictures with our lambs. After years of trying to convince him, I finally wore him down and we built a chicken coop. He was the foreman of course and I was the laborer, which was fine with me. When the chickens were finally old enough to move into their new castle, I named them all Pretty Girls. My neighbor, Denise had named her chickens after the matriarchs of the church like Sylvia and Miss Pierce. I knew that I could not come up with better names, so Pretty Girls is what it was. They all looked the same anyway. Life was great as a chicken farmer. Every morning I would have the Pretty Girls stand up to give me my breakfast which they willingly would do. Until one day when I realized that one chicken deserved a name. One morning when I went to feed the girls, I noticed that a chicken had made a hole in the dirt floor and had stuck her head in it to get away from the other chickens. They would peck at her continuously. I decided that I would rather let her out of the pen with the chance of her being picked up by a hawk, than to let her “friends” peck her to death. From that day on, the chickens names got changed to Mean Girls. And the victim was named Brunhilda after a character in the Bugs Bunny Opera, where Brunhilda is told, “you are so lovely”. I figured that name would make her feel loved when I came to feed her every morning while singing that song to her. It worked. She was very happy running around outside the chicken pen with the other chickens looking at her wondering how in the world she got out there. I built her a Brunhilda Chicken Hotel for one. Everyday she would run in her new home and lay her one egg and every night she would go in her custom hotel and sleep. The rest of her day she spent doing whatever she wanted to do freely running around between beach plum trees and eating bugs in the yard. Fortunately there were no hawk incidents. One day, the strangest thing happened. I opened up the door to feed the Mean Girls and Brunhilda waltzed right in. I said, “No Brunhilda, you don’t want to hang out with those Mean Girls.” She paid no attention to me and did not look back. I had to change the Mean Girls names back to Pretty Girls. They now live together in peace and harmony. It is a Brunhilda mystery that I will never be able to solve. Most of my young life I wanted to be an animal behaviorist. In 7th grade I was in an animal behavior club and one of my first jobs was working for an animal behaviorist at Princeton University actually taking care of slugs. Not just taking care of them, but making them thrive. I experimented with diet and conditions and weighed and measured them to find out the best way to raise them. I know it sounds strange, but I actually loved it. The only problem was, my second job was working in a flower shop and any slugs that I found ended up on the neighbors bushes. I worked too hard keeping them live in my first job. So it was no surprise that when I came to Stockton that I was on my way to become an animal behaviorist. One problem. I was math-phobic, failed my first calculus class and was told that now I would have to take physics and chemistry. I was devastated. I thought that no one understood that I did not want math and science, I wanted ANIMAL BEHAVIOR. I did not know that I needed math and science to follow my dream, so I had to find a new dream. After a year of college I left to try to figure things out. I moved back into my parents’ house, got a job at a gourmet food store and found someone who would allow me to be their apprentice and Batso State Park, teaching me to spin yarn and weave cloth. My mentor told me that she would give me one class. If she liked me, she would continue to teach me, if not, I would just have one class. She lived an hour away. Fortunately she did like me, and we spent 12 hours every Monday learning all of these wonderful things. I learned how to card and spin wool, dye, using natural dyes, weave on a 4 and 6 harness loom, and design and weave on a Guatemalan backstrap loom. We drank a lot of Earl Grey tea, and talked about solving many world problems that we mostly kept to ourselves. It was wonderful. My job in the gourmet food store also taught me so much. I became an expert in cheeses from around the world, was taught how to make quiche which was highly acclaimed by the New York Times food editor and make various dips and beautiful platters for catering. I am sure that this job was the beginning of my love of food, cooking, and feeding others. After a year of this, I decided to go back to college. I changed my major to Early American Crafts and Culture which was a combination of business, history and art. I had independent studies in weaving, spinning and dying, art and design classes, learned some of what was needed to succeed in business, and how history tied it all together neatly. I graduated with a Liberal Arts Degree and had no idea what I was going to do with it, but I finished, which is all my parents insisted on. During College I got a full time job working at the Historic Towne of Smithville. 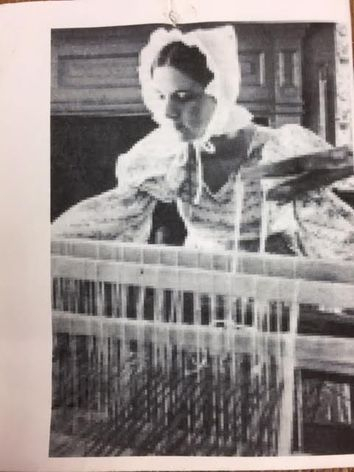 (at the time, it was a lot like Williamsburg is today) I was trained and perfectly suited to be their demonstrating weaver and spinner. I went to school full time and worked full time. I am not exactly sure how I did that. Everyday I got dressed up in a long dress, bonnet and shawl if it was cold and pretended that I lived in the early 1800’s. We all would come to work early and leave late, play instruments, square dance and spend our days making things and entertaining visitors. It was there I met my husband Gary who was the decoy carver. I often tell people that our relationship was built on lies and deception. He used to come to work early and pull a wedge out of my very large barn loom so it would move when I was trying to weave straight cloth. I would call on Mr. Gary to see if he could fix it, as he was a wood worker. He would bring a knife and piece of cedar and masterfully carve a wedge that fit perfectly in the spot that it needed to be. I was so impressed, not knowing that he was the one that sabotaged the loom to begin with, just to spend time with me. The first 2 nights after payday we went out on impressive dinner dates and then I would not see him for the rest of the week. He had spent his entire paycheck on those 2 dinners. Forty years later, it is still never dull. Fast forward a few years. We got married and had our daughter Amy, and then Megan, and then Robin. I had my loom set up, but the girls would play it like a harp and motherhood robbed me of the brain that I used to use to weave intricate patterns. One day I saw a show on PBS called The Wood Wright Shop and the host showed how to cut down a tree, shave off the wood to make it usable, and then weave a basket. I thought that I should be able to do that….minus cutting down a tree. I found a place that sold supplies for making a basket and from that day on, the second side of my sink in the kitchen was always full of water and reed ready to weave into a basket incase the phone rang or I had time in-between stirring a pot or tending to the girls. If the girls allowed me to continue to weave cloth, I never would have needed to take up basket weaving but then where would that have taken me? It is funny to think about. And in the beginning…….There was a fire. In March of 1986 I got a phone call that my favorite aunt was not doing well and if I wanted to see her, I better get down to Florida right away. I packed up our 3 daughters, age two, four and six, with all of their favorite toys, clothes and books, and traveled to my parents’ house in Princeton to care for the girls until I could get back. My aunt had passed away an hour before I arrived in Florida, so I did not have to tell her that it was ok to go, she figured that out on her own. I had to make arrangements for her funeral which would be in Princeton. Two days later we had the funeral, went to sleep at my parents house ready to leave the next day. At 2:00am the phone rang that our house was on fire. Gary jumped in his car and made a one hour and forty five minute trip in 45 minutes without being pulled over. (that is a miracle). When the girls woke up I loaded up our car and began to make the trip back to Port Republic to see the condition of your home. When I pulled in the driveway, I could see a large burned out hole in the side of the house where our wood stove was. I thought to myself, well we can just put a piece of plywood over the hole and still live there, but when I walked into the house I could see soot and water dripping from the ceiling, with very little being recognizable. The fire company had done the best they could, but a mostly cedar and pine house did not stand much of a chance of surviving. We live in such a wonderful town with many caring people. One woman came to me with a type written list of things we may need. I would have much rather given her my coat, which was almost all that I had, than have to need anything from anyone. The truth was though, that we had nothing. She explained to me that so many people are very glad that this did not happen to them and that by me accepting things, it would make them all feel so good about themselves, that I was doing them a favor to accept their generosity. Twisted?…yes, but it made me feel a little more comfortable. Someone else found us a rental place to live in Port Republic, which was very rare. The “getting started again shower” was at the Port Church and we were given so many things to get started, so all we needed was our home to get fixed and we could go on with life. Unfortunately it took 5 long months to settle with the insurance company. They wanted us to save part of a wall and part of a ceiling, when really the whole house had to be gutted and the most frustrating thing was that we could not clean or throw anything away until we settled with the insurance company. At the time it was excruciating not to be able to move forward, but now I can look back and see that it was all part of God’s plan for our family. If we had settled right away we would have put back exactly what we had which was a two bedroom, two bathroom “Depression Bungalow” (as Gary called it) with a partially finished attic. Since we had plenty of time to think about it, I said to Gary, why don’t we build a classroom on our house to teach people the crafts that we know to give back to those that were so kind to us and others as well? That can be our “give back”. Once that decision was made, magically the insurance company settled and we were able to finally get started. Gary wanted to build the house by himself, but he already had a full time job so we hired many people, most of which he fired because they did not do as good of a job as he could. This is why it took us 2 1/2 years to get back in our home. In September of 1988 Swan Bay Folk Art Center opened its doors to the public. I taught Kindermusik for preschoolers, basketry, doll making, later my three girls and I started teaching classes around the American Girl Dolls. Gary taught decoy carving and had a Revolutionary War Militia for teaching soldiering and wood working skills until his knees just would not allow him to march anymore. Now I primarily teach basketry with some wool felting classes mixed in, but I would not trade away any of the days that I have spent teaching others to put themselves into what they make. I realized early on that women especially, need a safe environment to “think through their mouth”. This is how most women process things. When you are sitting and doing something creative it is relaxing, and if you are able to figure things out in your life at the same time........ Bonus. Now, don’t think that I am too strange but for a long time after our house was destroyed, I made cherries flambé (that is flaming cherries for those that don’t know) on the anniversary of our fire, just so we would not forget where this story all started.